When you are a musician hitting the open road, going on tour is the ultimate dream. Living on a big tour bus, going from city to city, and playing nationwide venues is what a musician lives for. But, to sell out those venues you need to promote your tour. There is no better promotional tool than the very tour bus that’s taking you from city to city. 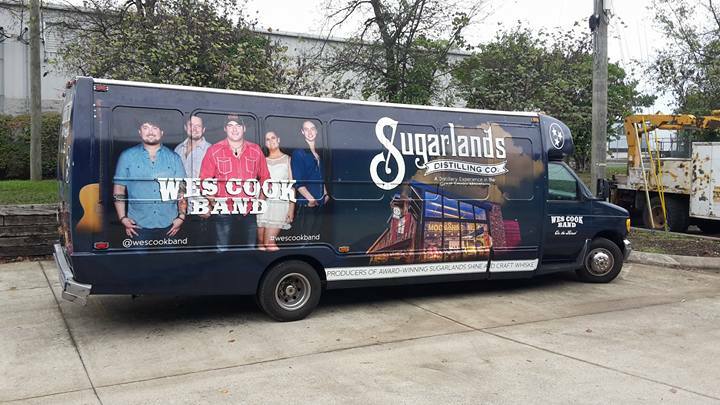 Take advantage of every advertising opportunity, and let us custom design a tour bus wrap to get your message out there! Turning any vehicle into a rolling billboard is one of the most cost-effective ways to advertise. If you’re traveling in a tour bus, you not only get the benefits of a vehicle wrap, but you literally get the size of a billboard. And, you get to promote your tour all day, every day, wherever you go. It’s the cheapest and most effective way to run a national ad campaign. But you need to make sure that you work with professional wrap designers and installation experts. A bad vehicle wrap, whether it’s poorly designed, or poorly installed will make a bad impression. A custom fitted wrap designed specifically for your tour bus is worth its weight in gold. There’s a lot of space on a tour bus, so you may get overly excited about all the information that you can fit on there. Despite the extra advertising space on a bus you still want to keep the design simple. Remember, a tour bus wrap that travels from city to city will need to be specific enough so that people understand what you’re advertising, but also general enough to fit every city and every date. We recommend that instead of going for more information, you go big! Use a big, high-resolution photo of the musician or band, the name of the tour and the artist in big, bold, legible text. If you have a font that is specific to your band, use that. When it comes to the logistics, like the dates of the tour and the contact information, make it simple and easy to read. Place the photo and the text so that the composition fits the space of the bus. Everything should be proportionate so that the arrangement of the whole image is eye-catching. Although we never recommend too much text in a vehicle wrap design, when it comes to a tour bus we think it’s a great idea to list tour dates and cities on the back of the bus. That way, anyone sitting behind you at a traffic stop, or driving behind you on the freeway can check out your tour schedule. It’s the perfect use of advertising space on your tour bus. All of our vehicle wraps are custom designed and fitted to the exact model of your vehicle. Our facility is big enough to wrap your tour buses. We’ll help you come up with the right design to turn your tour bus into premium advertising and reach new fans. The installation will be done using premium vinyl in a climate controlled facility.